This is just the right size for your smaller outdoor area. The Treasure Garden Market Aluminum 7.5' Octagon Collar Tilt Patio Umbrella offers you an elite level of quality and style. It is sure to be the centerpiece of your patio. This outdoor umbrella is made with high quality aluminum that has been powder coated to resist wear and rust in the harsh weather elements. With the premium quality, fade resistant Sunbrella and Obravia canopy fabrics, your umbrella is sure to retain its stunning color from season to season. 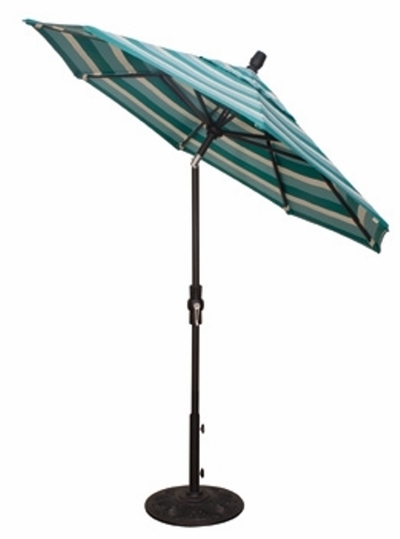 The added Collar Tilt function makes it simple to angle your umbrella for the perfect amount of coverage. For an additonal touch of flair add some umbrella lights to keep the relaxation going well into the night. This is a charming addition to your open air space that is sure to delight. * Weight: SWV: 21 lbs. DWV: 22 lbs.